This creature is adapted from Outland Art’s Mutant Epoch RPG; the name is swiped from Gamma World. 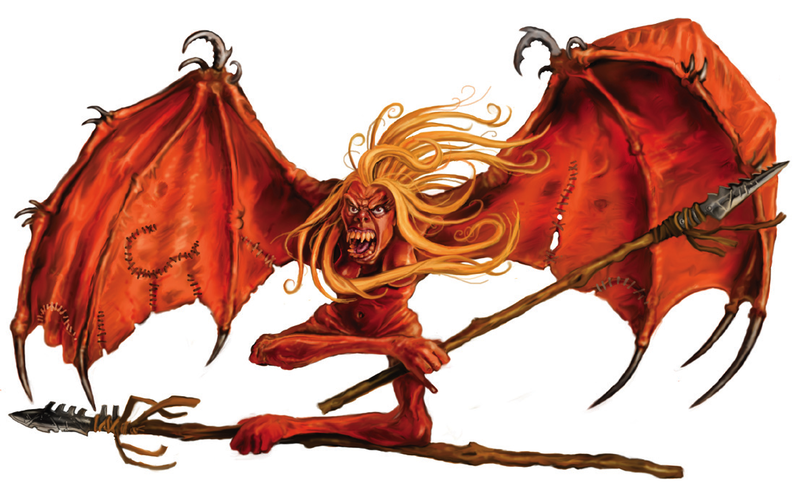 You can download the Muto-Harpy supplement for free from the Mutant Epoch Forum. Carrins (also known as Muto-Harpies) are winged humanoid mutants who often nest in the ruins of urban skyscrapers. From these aeries, they manage flocks of birds for both food and hunting companions. Although able to wear clothing or modified junk armor, they often go entirely naked, their skin colours ranging from dark brown to orange and all the way to albino white. Their hair color also varies, and for females is worn long and free flowing while males tend to shave their heads bald. Carrin society is matriarchal, and males are outnumbered. An aerie may contain up to 20 individuals. Carrins can be negotiated with if explorers approach – but do not enter – their skull and feather totem marked territories. Carrin Brave (#Enc 2d4): HD 2d6, AC 9, MV 6″ (land) / 12″ (air), SV +2, javelins (ranged Atk +2, 1d6), 200 XP. Winged flight, thin-skinned (+1 damage per die from physical attacks). Carrin Patch-Wing (#Enc 1d4): HD 3d6, AC 6 (junk armour), MV 6″ (land) / 9″ (air), SV +3, sabre (melee Atk +3, 1d8) or short bow (ranged Atk +3, 1d6), 300 XP. Winged flight, thin-skinned (+1 damage per die from physical attacks). Carrin Bird-Speaker (#Enc 1): HD 3d6, AC 9, MV 6″ (land) / 12″ (air), SV +3, beak (melee Atk +3, 1d6) or 2 talons (melee Atk +1/+1, 1d4/1d4), 300 XP. Winged flight, thin-skinned (+1 damage per die from physical attacks), natural weapons, avian psi-charm (makes birds allies). Carrins are often accompanied by vulchlings (2-in-6 chance) or other mutant avians. Groups containing a bird-speaker almost always have avian companions. Exceptional Carrins may advance in rank, typically as scouts. Monster stats are fun! 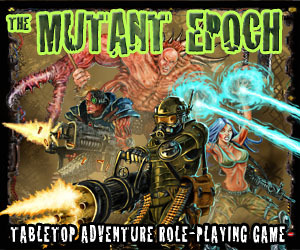 Here’s another one swiped from Outland Art’s Mutant Epoch RPG, this time from the Hub Rules. Land Pikes are amphibious predators that can be encountered in or near water. They are sometimes found underground in flooded ruins. Although slow on land, these creatures often mass together in groups to corner and bring down prey. Their four walking fins are clawed and webbed, allowing the Land Pike to climb up steep banks, staircases, and the sides of water vessels. Land Pike, Juvenile (#Enc 1d8): HD 3d8, AC 6, MV 3″ (land) / 12″ (water), SV +3, bite (melee Atk +3, 1d8), 300 XP. Amphibious. Land Pike, Adult (#Enc 1d6): HD 5d8, AC 5, MV 3″ (land) / 12″ (water), SV +5, bite (melee Atk +5, 1d10), 500 XP. Amphibious. Land Pike, Elder (#Enc 1d4): HD 7d8, AC 4, MV 3″ (land) / 12″ (water), SV +7, bite (melee Atk +7, 1d12), 700 XP. Amphibious. Individual Land Pikes may possess additional mutations. 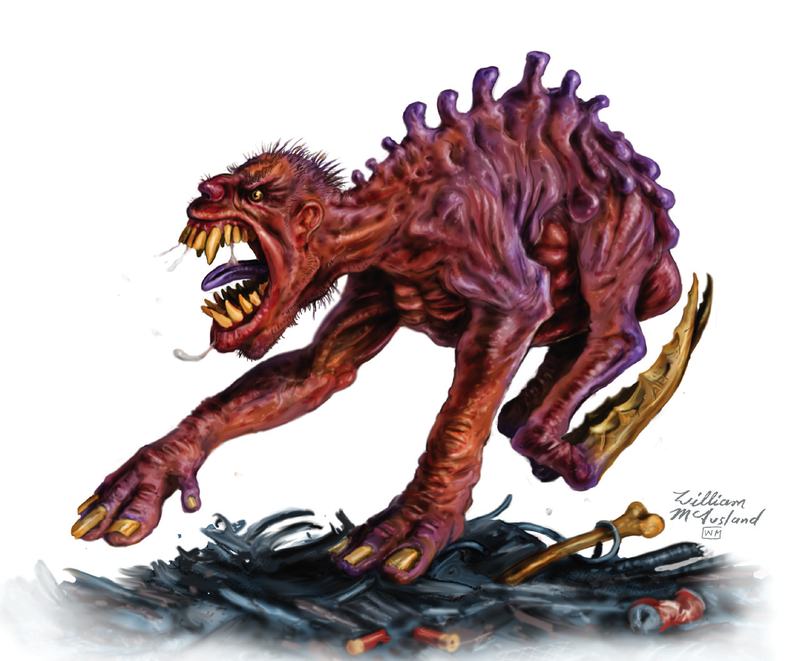 This creature is swiped from Outland Art’s Mutant Epoch RPG. You can download the Spikeback supplement for free. Spikebacks are large, hunched, animal-like humanoids of low intelligence and wicked disposition. They are so named for the lethally sharp bone spikes growing from their backs, which are remarkably effective in dissuading larger beasts from feeding on them. These monsters do not actually employ their spikes when hunting, instead attacking with claw slashes and bites. Although the attacks are terrible in themselves, bite wounds from a Spikeback often infect the victim with a disease known as ‘meat-rot’. Spikeback (#Enc 1 or 1d6): HD 5d8, AC 5, MV 12″, SV +5, bite (melee Atk +5, 1d8 + meat-rot) / 2 claws (melee Atk +3/+3, 1d8/1d8), 500 XP. Meat-rot (victim cannot regain hit points until disease is cured, fortitude save to resist). Individual Spikebacks often possess additional mutations (3-in-6 chance). Spikebacks hunt either alone or in small packs of up to six members. While highly territorial toward other animals and humanoids, they are strangely tolerant to other, unfamiliar Spikebacks. Presented here are three examples of mutant humanoid genotypes in Tempora Mutantur – skullocks, morlocks, and grimlocks. These creatures serve roughly the same in-game roles as goblins, hobgoblins, and bugbears do in D&D. Refer to the Mutational Evolution rules if your PCs are getting too familiar with these foes. Remember that humanoids are more likely than other creatures to use Ancient relics. Each humanoid encountered has an x-in-6 chance of carrying scavenged goods, where x is equal to the creature’s HD (roll once for each individual). Also, not all encounters need be hostile. Refer to the rules for NPC and Monster Reactions from the Humanoid Encounters supplement. I’m on a roll lately… I whipped up this rules supplement based on some recent posts. I was able to fit all of the genotype text (with extras) plus the expanded enforcer, scout, and thinker class descriptions – but wasn’t able to include the progression tables. Snazzy artwork swiped from Mutant Epoch by William McAusland. Should come in handy for tabletop sessions, especially tournament games. 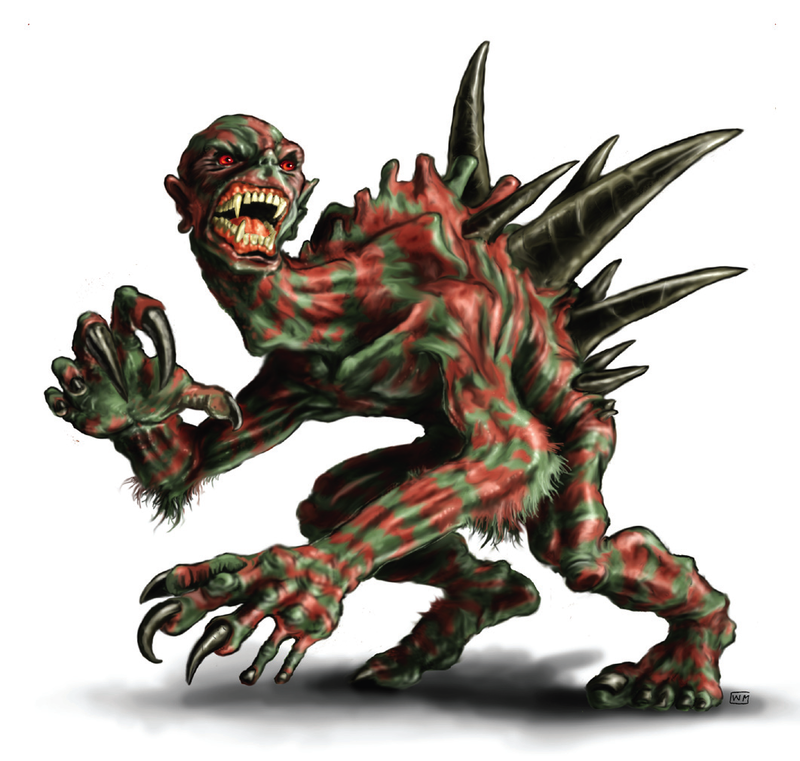 This creature is swiped from Outland Art’s Mutant Epoch RPG. You can download the Red Harvester supplement for free. The Red Harvester is a hideous worm-like mutant creature. It inhabits dense terrain where it can conceal itself from the sun and ambush passing prey. Although called a red harvester, it has chameleon like powers and can pass entirely undetected in vegetation and junk. Red Harvester (#Enc 1): HD 3d8, AC 7, MV 6″, SV +3, 2 energy blades (melee Atk +3/+3, 1d12/1d12 plus will save vs. stun), 600 XP. Chameleon (can roll two Skill checks for surprise and take the best result). While these creatures are little more than mindless eating machines and have no use for relics, they do tend to drag away the corpses of prey – especially ruin explorers – and stash the cadavers in dark, subterranean lairs (3-in-6 chance of relics in stinking body dump). 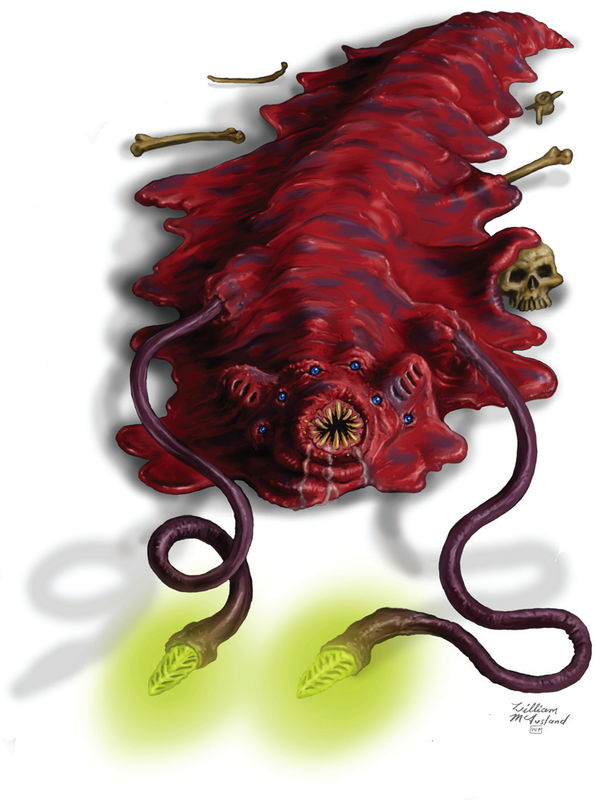 This creature is swiped from Outland Art’s Mutant Epoch RPG. You can download the Sickle Foot supplement for free. A Sickle Foot is a nasty, nightmarish pack hunter of about the size of a large dog. They appear more like mutant beasts than humanoids, but Sickle Feet are intelligent and can speak to each other in a language of grunts and growls. In an attack, Sickle Feet charge out from cover and converge on the nearest target, leaping up at the last second and extending their clawed feet to rend their prey open. Sickle Feet have excellent morale and will stay in a fight at least until three-quarters of their own number are defeated without inflicting equal casualties among their targets. Sickle Foot (#Enc 2d4): HD 2d6, AC 7, MV 12″, SV +2, 2 sickle feet (melee Atk +2/+2, 1d6/1d6), 200 XP. Those who have encountered Sickle Feet also report that some individuals exhibited additional mutations.